Did Challenger SRT8 Auction Expose eBay Reserve Pricing Error? Two days ago we told you about a ChallengerTalk forumite who may have been getting screwed by a dealer on a cheap eBay'd 2009 Dodge Challenger SRT8. The dealer claims an eBay malfunction caused the cheap deal. Here's what happened. 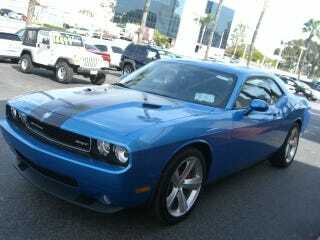 Car Dealer Trying To Screw Enthusiast Out Of Challenger SRT8 Auction? Alex has been perusing the lots of Glenn E. Thomas Dodge Chrysler Jeep for months lusting after the Challenger SRT8 and was considering a Plum Crazy Purple model. Problem is, the cars were sold out and he was reluctant to order one. Time goes by, he builds rapport with one of the salesman named Brad Davis who, being a good salesman, did his best to get him into something, including a B5 Blue 2009 Challenger SRT8 with a manual. Alex sat in the car, and felt it out, but no deal, it had to be Plum Crazy, so he waited. He waited until last Friday that is, when he spotted the same blue car on eBay and it happened to be missing its reserve. He placed a bid of $29,100 on the car not thinking he'd have a rat's chance at a snake convention. The salesman got an email from eBay saying there was a bid on a car and he fired off an email to Alex thanking him for the bid and encouraging him to come down to the dealer and consider making a deal that day. He probably should have been singing a different tune though, because he didn't know there was a problem with the listing. Prior to that day, the car had been priced higher, but Brad went into the listing and lowered the "Buy it Now" price of $43,400 with a reserve of $42,995 on the last day of the auction hoping to lure in more bidders. Unfortunately the reserve disappeared and they didn't realize it. Then the auction ended and Alex had won a $43,000+ Challenger for $29,100, a crushing deal. Nearly immediately Brad fired off an email to Alex stating "Somehow the reserve got taken out of this Challenger. It should have had the buy it now price on it with the reserve of $43,425." Deposit: Deposit of $500 must be paid within 24 hours of auction close. Payment: Items will not be available for pickup or shipping until full payment is received and cleared by our local bank. Buyer has 5 days to pay. Warranty: Equipment is covered by manufacturers warranty only. Return Policy: If you are not satisfied with your equipment upon delivery, please notify us immediately. Availability: We reserve the right to remove this listing due to on-site sales. Disclaimer: This auction is a legally binding contract to buy this vehicle. All vehicles are sold as-is unless otherwise specified. I have done my best to accurately describe this vehicle. It is up to the buyer to come see and further inspect the car before the end of the auction. When the auction ended Alex received an email from the eBay system informing him he'd won and was now obligated to provide the $500 deposit within 24 hours. He made an attempt to transfer the deposit via Paypal but was informed the account was incapable of taking payments. Frustrated, Alex emailed Brad a .pdf copy of the listing and said he'd be happy to pay the $500 deposit immediately as long as they'd tell him the preferred payment method. Nobody returned Alex's emails the rest of that Friday. Saturday was a flurry of activity with Alex getting on the horn with the dealership attempting to get his deal, relying on the fact that he had what seemed an ironclad case. Trouble is the dealer wouldn't direct him on how they'd take payment on the deposit, they also sent a request on eBay to cancel the transaction. He was informed the car would not be sold at that price as it was worth much more, but they'd be happy to offer him discounts on other Challengers. We spoke with Brad and another salesman confusingly named John Davis who've both been involved with Alex and this car in particular. Both say they don't understand how the problem with the reserve price happened. Their dealership isn't exactly new to eBay, with around 218 listings on the site, but somehow the reserve disappeared when the price was lowered. They've actually called up their eBay representative Chris Brown, who has not yet answered our calls, to find out what had happened. Hanson reportedly responded with "sometimes this happens." Being seasoned veterans of eBay Motors ourselves we're not at all satisfied with this response if it's in fact what was said. This doesn't mean someone at Glenn E Thomas didn't fat-finger the reserve away, but there's possibly another avenue of fault. "I don't think we should be 100% accountable for a mistake that may have been eBay's fault. We've been around for 100 years and customer service is our highest priority and I'm willing to take a loss on a car, but to a point," said John Davis. He went on to say "I talked with Alex to try to get to a price that would be hurting us but still give him a substantial deal, better than anyone anywhere could ever get on a Challenger, but I guess we're at an impasse." Is eBay's system flawed? Or is this a case of someone just having a bad day, keying in the wrong pricing and trying to find a way to pin the blame elsewhere? While we haven't spoken with Mr. Hanson, we have spoken with others at eBay, who tell us they're hunting down the details of the auction. We'll find out more sometime later today. So where does that leave them? Alex has a lowball bid on a lovely blue Challenger and what sounds like a pretty legally binding disclaimer in the listing. What he doesn't have is the deposit on the car delivered within the 24 hour window mandated by that same contract because the dealer more or less wouldn't accept the deposit. The dealer is looking at a huge loss on a money-making car because of what they claim was a system malfunction at eBay. They've already offered Alex sweetheart deals on Challengers to no avail, the man wants his car and he wants it cheap, rightly so. Neither side wants to get lawsuit-happy and both sides are being cordial and talking with us (some dealerships should take note — this is the right way to deal with customer service issues). We guess we'll have to wait and hear what eBay has to say later today. Kentucky Hyundai Dealer Won&apos;t Honor eBay Auction Deal, Calls Buyer "Psycho"